Live microorganisms surround us daily. They live inside our digestive system, or even on the outside of our body. Many of these microorganisms include bacteria and yeasts that help to fight off bad bacteria, strengthen our immune system or aid in digestion. Many people obtain these beneficial microorganisms from live cultured milk products such as yogurt. You can also obtain the benefits of the microorganisms from probiotic powders. Wait until you are ready to eat to begin mixing your probiotic powder. Use a measuring cup to measure out ½ to 1 cup of milk or water. Place the milk or water into a saucepan and heat it on medium-low heat. Heat the liquid just until it becomes warm. Pour the warmed liquid into a coffee cup. 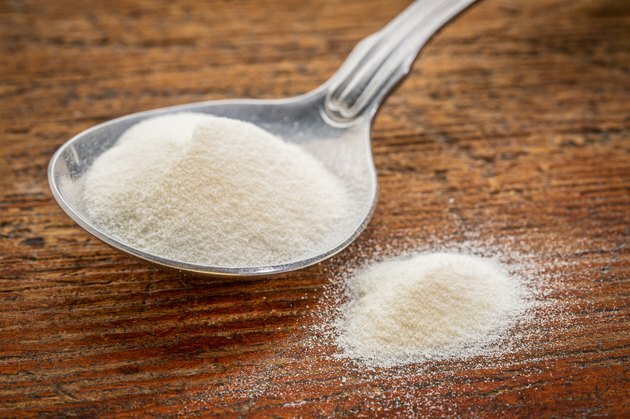 Read the package of your probiotic powder to confirm what the correct dosage is since it may vary between brands because of differences in the type and amount of microorganisms present. Use 5 tbsp. of powder for an adult dose of LifesVigor probiotic powder, and ½ to 1 tbsp. for a child. Use 2 or 3 tsp. for an adult dose of BiotiKid, and 1 tsp. for children. Mix the powder into your warmed milk or water until it is well-blended. Drink your mixed probiotic beverage with your meal. You can also mix your probiotic powder into soft foods such as yogurt if you prefer it to milk or water. Probiotic powders can irritate the lungs. Avoid breathings in the powders or getting them on your skin. Consult a doctor if you are allergic to acidophilus, lactobacillus or other types of bacteria or yeasts that may be present in probiotic powders. How Much Caffeine is in a Chai Tea Latte?